Is this the bluebird of happiness? It certainly added a bit of happiness to my morning. 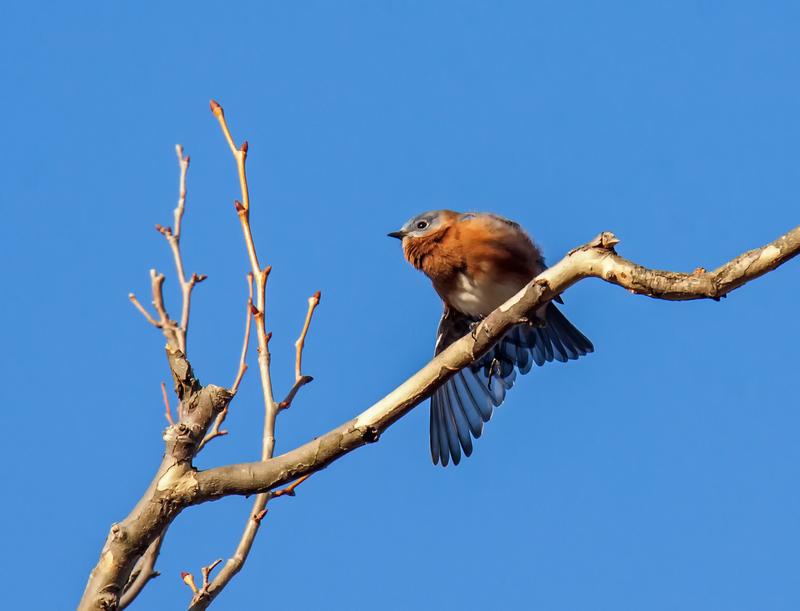 Despite trying to attract them, this is the only place I have seen a bluebird in many years – thanks Mike. Nice Mike! Always fun to see Bluebirds! But it is better to be able to photograph them! We are planning a multi-week trip to Florida in the Spring, have to check out Occoquan NWR on the way! You definitely should stop by Occoquan NWR. One of the nicest things about the refuge is that there generally are not too many people around–I prefer to wander about on my on and not as part of a group. There are always interesting things to see and shoot, though sometimes you have to look hard. You should let me know when you plan to be here and I can give you a guided tour of some of my favorite spots there. Oh, Mr. Mike! Benjamin will absolutely love this Orange Bluebird, you know that they are his favorite bird! Both Benjamin and Mommy are ill, so he won’t be here until Monday. He has an acute otitis media (middle ear infection) and is on antibiotics and prednisone for the wheezing in his lungs. Unfortunately, he is quite prone to respiratory infections. But, as he told me on the phone this morning : “Don’t worry, I will feel betterer in a few days.” Thank-you! on December 27, 2018 at 7:45 pm | Reply Molly D.
Terrific wing feathers! And against that clear sky they look spectacular! Wow, what a spectacular photo, Mike. Diaphanous tail feathers. That sky is perfectly blue, and the bird is beautiful. Thanks so much. We have broken a record this year for annual rainfall, so it is a special joy to have a day with sunshine.